I have a huge collection of shimmer polishes that I am currently working my way through wearing. I've decided not to simply swatch them, because I want to enjoy wearing each one of them as a full mani. 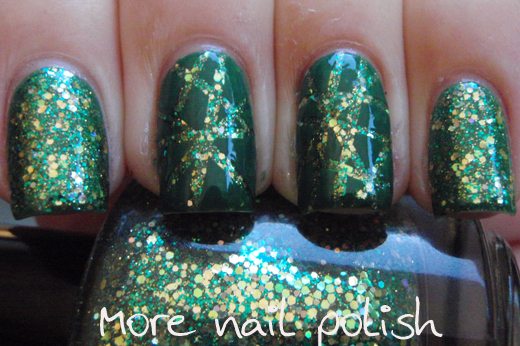 Today I have two more Shimmer polishes to show you, Julia and Kelly. 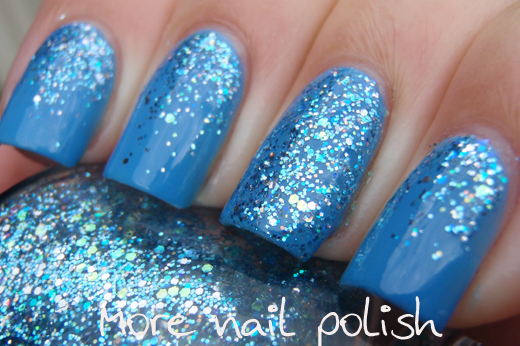 Julia is a combination of various light blue glitters and a few silver glitters. All the glitters are small and it's so easy to apply. This is two coats of Julie on my ring finger and a dabbed gradient on the other fingers. 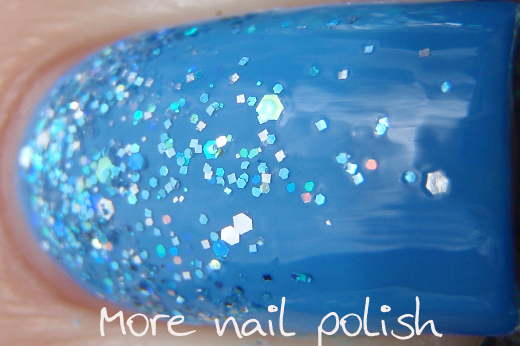 The base colour is OPI No room for the blues. 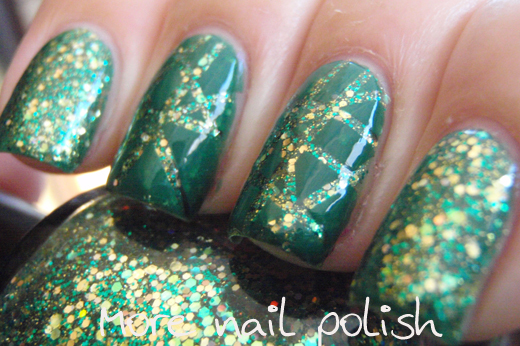 Kelly is a mix of lots of green and gold glitters of various sizes, but overall still small glitters. I put two coats of Kelly over OPI Jade is the new black, then later I decided to add a bit of crazy taping. I wanted to add lots of tape so plenty of the glitter beneath would show through, but I think I might have used a few too many stripes. 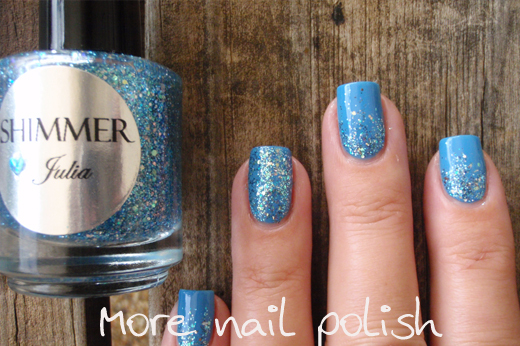 Shimmer polishes are available from Cindy at the Shimmer Polishes site. 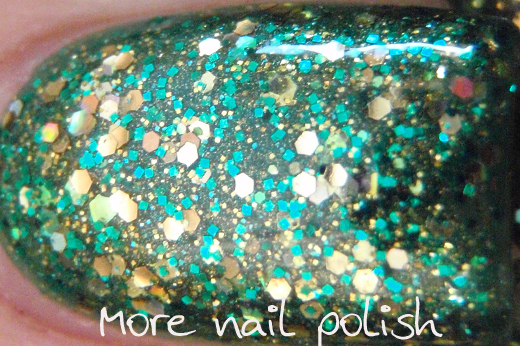 There are more that 50 different polishes in the collection and they are all the same fine glitter combination style. The hardest part is trying to decided which one to get or wear. Cindy will also made custom glitter colour blends if there is something specific that you are after. 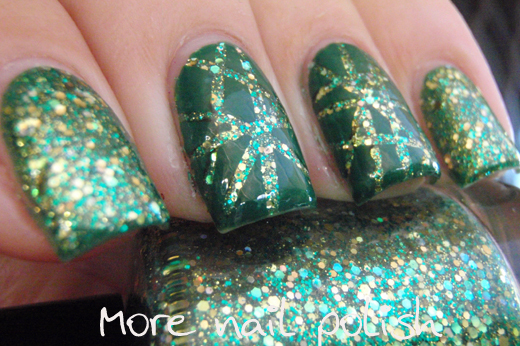 Great glitters, and I don't think you overdid the tape at all. I love it! I love Julia and what you did with it! I think the taping looks fantastic - I've never tried taping but I'm really inspired to give it a go after seeing this!